- Maintains consistent mesh openings that aids in preventing spot moire. - Warp and weft threads are balanced to stretch equally during the print process. 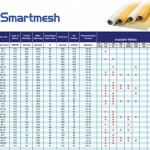 - Smartmesh reaches stable tension levels quickly and retains work hardened. 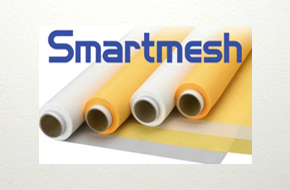 - Smartmesh has memory, it resists both the initial pull of the squeegee as well as forces during the print stroke to preserve registration from the first print to the last. - On finer meshes, the thread surface is treated to help ink transfer to substrate instead of hanging up in the mesh, yeilding a better reproduction of artwork. - Retains tension better than any mesh available. - Resists Accumulated Elongation Percentage. During printing the squeegee pulls on the mesh causing temporary stretch as it warms up. Smartmesh has memory for dot onto dot registration during the print run. - Uniform mesh openings create consistent prints, better opacity, and predictable moire control. - The weft and warp threads are balanced to resist the print forces optimally to improve registration abd orubt quality. - On mesh above 280 the thread is treated to allow inks to pass through much easier for more consistent printing.